The most complicated two weeks of my summer are over. I have completed Greek Exegesis – two weeks of intense, in-depth Greek grammar and interpretation for several hours a day. Plus homework almost every night, and starting an online class right in the middle of it. Mom came up to help us out again, setting up camp with Bethany on one of our couches and in the yarn/guest room. I was really apprehensive about how it would all go – how would Naomi handle being in Mom’s care for several hours a day? Would her naps coincide with my break times, or would I have to miss a substantial amount of class in order to feed her enough? Would I be able to keep up with the homework? During the second week, Bethany had signed up for an art class downtown – would Mom be so wiped out from the commute that taking care of Naomi would be too much work? And then an amazing thing happened – it worked perfectly. We discovered, in trying to work ourselves around Naomi, that she is quite ready for a three-nap schedule, and has started consolidating her morning and afternoon naps sometimes. It usually worked out to nurse her during my morning break, and every day except one I nursed her to sleep during my lunch break and she slept right through my afternoon session. During the second week, Jared’s job at the school lightened up enough so that he could tag team with Mom. And then, just for fun, one of my favorite musicians was having a free concert in town – free, and in a park where we could bring both baby and Mom’s dog, and everyone liked the music. It’s as if God was saying, not only do I want you to finish this degree in good time, I want you to have fun doing it. Mom and I did a lot of crafting over those two weeks, but one thing I can show you right now (since it’s, you know, finished), is our celebratory projects. 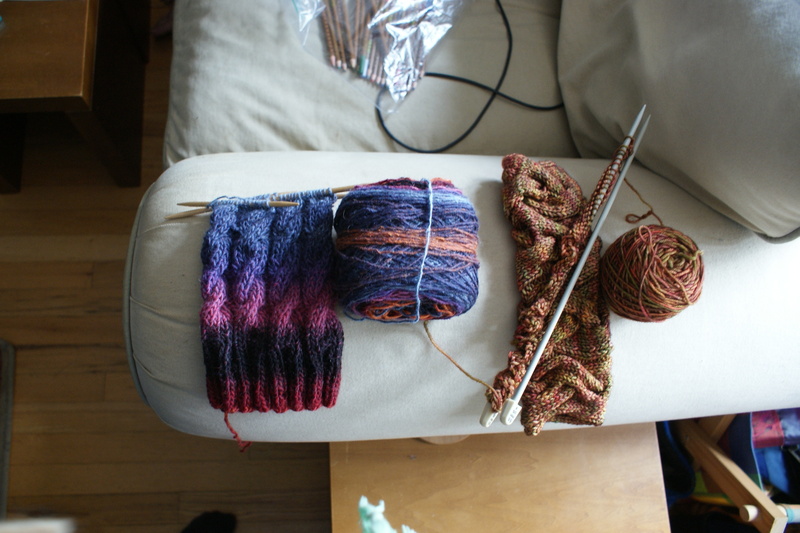 We both splurged on some yarn when Naomi got her harness off several weeks ago – leg warmers for Mom, arm warmers for me. My project being significantly smaller, I finished it a few weeks ago, but Mom blasted through her leg warmers so that we could take pictures of them together before she left today. I used Madelinetosh Tosh DK (formerly known as worsted), which is a freaking gorgeous yarn. 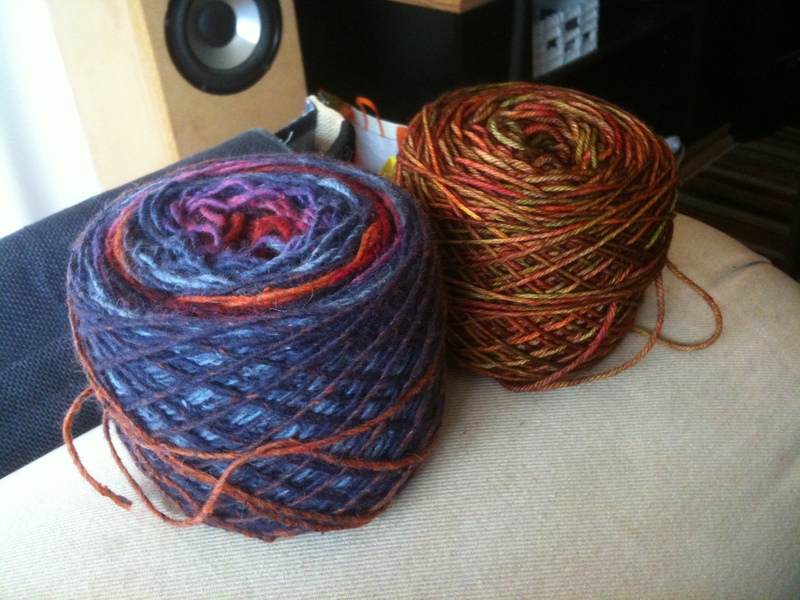 Like Tosh yarns are, they are beautifully dyed and amazingly soft. The spronginess of this base makes for excellent stitch definition. My only complaint is that it’s too expensive for me to buy very often, though the price is not unreasonable for how nice it is. And they seem to be confused about gauge, which is annoying when I’m trying to sell it. (I still call 5 st./in. on us 7-8s “worsted,” 5.5 st./in. on us 5-6s “DK,” and 4-4.5 st./in. on us 8-9s “aran” or “heavy worsted.” I have no idea how standard that is, but I get annoyed when people interchange those terms, and throw in others like “light worsted” for DK or such crap. Standardize, people.) I would still call this a worsted. Even knit on US9s, I got gauge on a pattern that called for an aran weight. It made the fabric on the looser side, but it was perfect for the rumply cables. This was a perfect excuse for me to knit “Wanderlust.” The pattern is tres cool – big fatty cables mimic the effect of scrunched up fabric, without taking up as much yarn, and with a much more controlled final product. I was in serious danger of running out of yarn, so instead of casting off and seaming, I picked out the cast on and grafted a seam. I don’t really know why the pattern didn’t go this route anyway; if I knit them again (which I well may), I’d just use a provisional cast on. 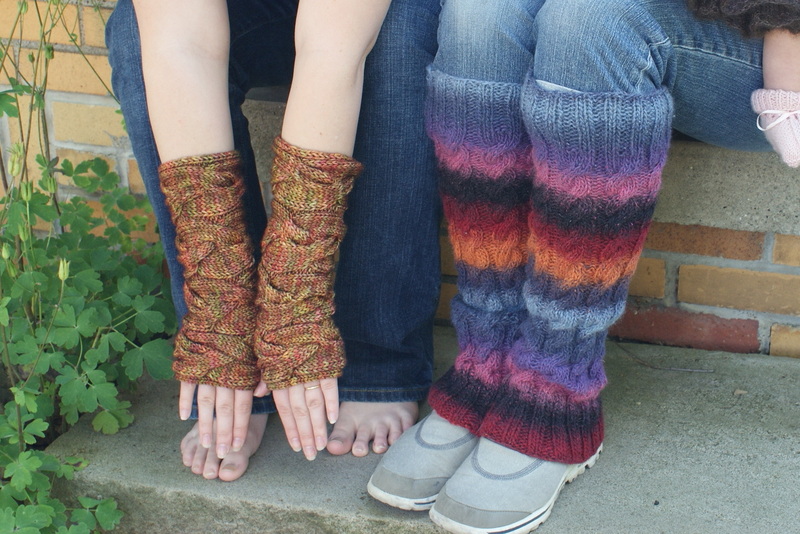 Mom used a simple cabled legwarmers pattern to show off the striping yarn, to excellent effect. She may have cheated a little to get the stripes to line up, but you can’t tell in the least. Are they not the cutest with jeans? I want her to wear one upside down. It is quite a thing, getting to share one’s life with one’s mom as a mom. Being a mom is so much work, and the only way your progeny can possibly appreciate what you are doing for them is by finding themselves in the same position. I am just grateful that we were able to share close quarters for a while so that she could enjoy this gift. I can only hope the same thing happens with Naomi someday, though if God calls her on a different path, that will be more than fine – because the real gift of successful motherhood is having a successful child, whatever that means. It was hard parting ways again today, and for more reasons than all the free housework that got done while I was out playing with Greek participles. One of the things Naomi is teaching me is to appreciate every joy of the moment for what it is, and not try to greedily prolong it just because I like it. Precious moments are so temporary, and I’d be lying to myself if I tried to make them hard to let go. But the appropriate prolongation of any joy is in memory and reflection with thankfulness. I enjoyed knitting with this yarn so much I hope to get more some day soon. I love simple knitting with gorgeous yarn.